The mass shooting at a Florida high school that left 17 people dead has sparked calls for walkouts, sit-ins and other actions on school campuses across the United States aimed at pushing lawmakers to pass tougher gun laws. The Network for Public Education, an advocacy organization for public schools, meanwhile, announced a “national day of action” on April 20, the anniversary of the 1999 shooting at Columbine High School in Colorado, in which two students opened fire on their classmates, killing 12 students and one teacher. The organization is encouraging teachers and students to organize sit-ins, walkouts, marches and any other events to protest gun violence in schools. “The politicians sit on their hands as our children and their teachers are murdered in their schools,” Diane Ravitch, the group’s president, and Carol Burris, its executive director, said in a post online. The protest plans circulated widely on social media on Saturday, signaling that the outcry for new gun legislation may not fade away as it has after other recent mass shootings. Many of those shootings, including the deaths of 20 first-graders and six educators at Sandy Hook Elementary School in Newtown, Connecticut in 2012, led to a push for new gun laws, but those efforts stalled in Congress. “We need to make this moment a movement and to actually make changes that need to happen in this country so that these kinds of weapons, AR-15s, are not in the hands of people who shouldn’t have them,” said Randi Weingarten, president of the American Federation of Teachers, a union representing teachers and other educators. Weingarten said she was part of the discussions about the April 20 protest. What gives the Florida shooting more potential to spark change, she said, is that the students themselves got angry really quickly and demanded it. Teenage survivors of Wednesday’s shooting at Marjory Stoneman Douglas High School have become advocates for gun control, sparring with gun-rights activists on social media and calling for safer gun laws at vigils and in television interviews. 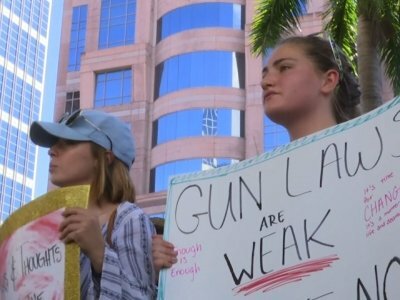 Thousands of angry students, parents and residents demanded stricter gun control laws on Saturday at a rally in Fort Lauderdale, which is about 20 miles from the site of the shooting in Parkland. Some people in online posts called for a Civil Rights-era style boycott of schools until gun laws are changed. David Berliner, a professor of education at Arizona State University who also participated in the plans for the April 20 protest, said he would support such a boycott. He recalled watching a television news report about Wednesday’s shooting at an airport. “I’m crying, and I’m watching all the people all around me crying, and I just said, ‘This has got to stop,’” he said. Clare Schexnyder, a mother of a middle-school student in Decatur, Georgia, said she wants moms to take their kids out of school for a day to make a statement. She said a private Facebook page she launched announcing a meeting of her Stop School Shootings group after the Florida shooting attracted more than 7,000 followers overnight. Her protest is planned for March 14. “President Trump talked about the American carnage in the United States. This is the American carnage,” she said. Associated Press writer Michael Warren in Atlanta contributed to this report. Follow the AP’s complete coverage here: https://apnews.com/tag/Floridaschoolshooting . This story has been edited to reflect that Georgia parent now says her protest is planned for March 14, not March 2.